Coll. No. 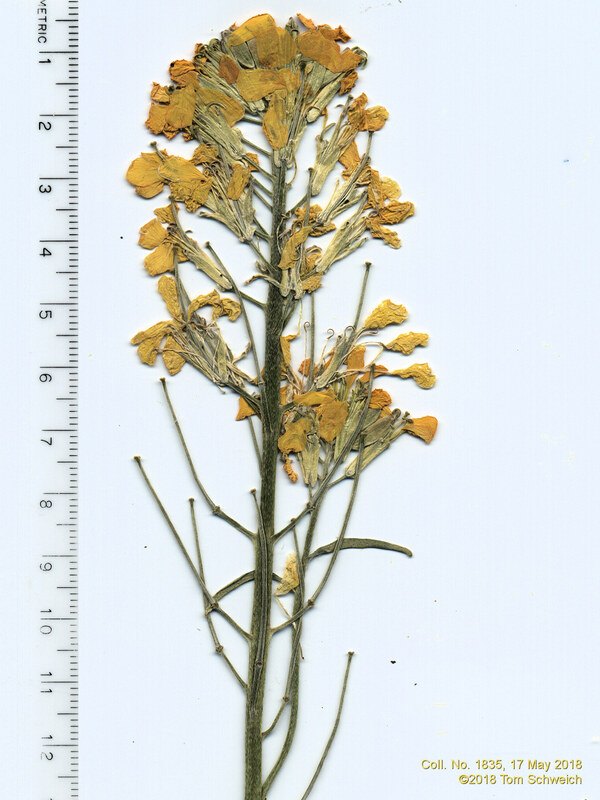 1835, 17 May 2018, characters observed: Perennial or at least biennial, terrestrial herb, hairs dolabriform throughout; Root, tap; Stem, erect, leafy, hairs as above; Leaves, basal and cauline, basal, simple, petiole, indistinct, ±10 mm., blade 50 mm. × 2.5 mm. wide, narrowly oblanceolate, 1-3 shallowly pinnate dentate, cauline, nearly sessile, 42 mm. × 2.5 mm. wide, ±linear, marginm entire; Inflorescence, raceme 130 mm. × 45 mm. wide, not bracted; Flowers, radial; Sepals, #4, rows, 1, 7 mm. × 1-1.5 mm. wide, narrow and wide pairs opposite; Petals, claw, 10 mm. + blade 6 mm. × 4 mm. wide, spoon-shaped, margin, entire, color, orange; Stamens, #6, 11 & 15 mm., tetradynamous (2 short, 4 long); Anthers, 4.5 mm. ; Ovary, 4 mm. ; Style, 9 mm. ; Stigma, capitate; Pedicels, 5-6 mm., ascending; Fruit, 17 mm. × 1 mm. wide, ascending, hairy as above. Field Notes: Coll. No. 1835, 17 May 2018.